An offensive line that needed upgrading and depth did not get either to a satisfactory level during the offseason. Can the upgrades at other positions cancel out the line’s potential weaknesses? 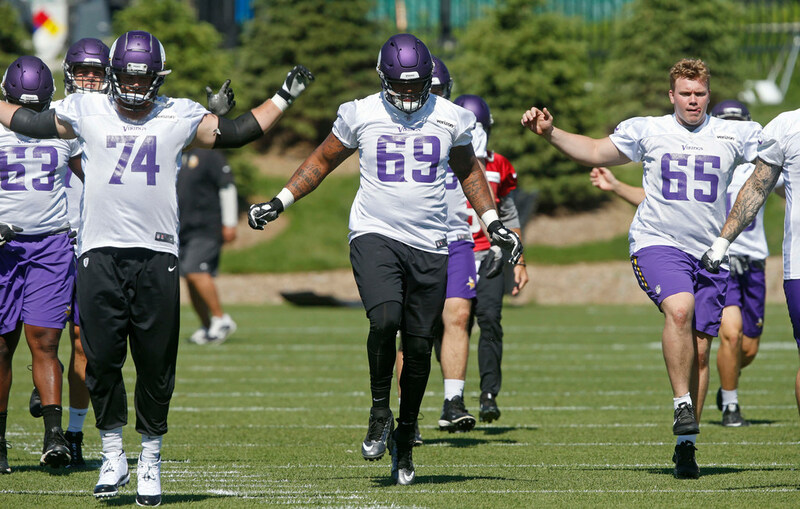 The latest edition of the Access Vikings podcast — at least a few minutes of it — is basically Part 17 of me yelling my concerns about the offensive line at fellow hosts Ben Goessling, Andrew Krammer. It was my first time back on the podcast after a two-week vacation, and in that time Mike Remmers and Rashod Hill injured their ankles while Nick Easton went on injured reserve. Pat Elflein, who said in early June that everything was on track for him to be ready for the start of training camp, is still on the physically unable to perform list. Joe Berger is still retired. Those are five guys who played key roles for the Vikings last season. Even in the best-case scenario, with Remmers (who is back at practice already, though not in 11-on-11 drills), Hill and Elflein ready to go in Week 1 against the 49ers, the line would look something like this: Riley Reiff (LT), Tom Compton (LG), Elflein (C), Remmers (RG) and Hill (RT). That’s a potentially adequate line, but it’s a downgrade from the regular season last year, when Pro Football Focus says the Vikings were No. 12 in pass blocking and No. 10 in run blocking efficiency. In the playoffs, as injuries mounted, the Vikings fell to dead last among the 12 postseason teams in pass blocking and No. 9 of 12 in run blocking. This year, PFF had the Vikings pegged as the 28th-ranked offensive line — and that was before Easton was lost for the year. An offensive line that needed upgrading and depth did not get either to a satisfactory level this past offseason. Other positions were prioritized, and maybe those strengths will cancel out the line’s potential weaknesses. Kirk Cousins is an upgrade. Mike Hughes looks like he’s ready to play immediately, easing at least some of the grumbling that the Vikings should have used their No. 1 pick on an offensive lineman. They are loaded on offense and defense. But a poor offensive line can undo a lot of that, so the only question that really matters is this: Will the offensive line hold up this season? That was the question four months ago, and we’re not any closer to a an optimistic answer now than we were back then.